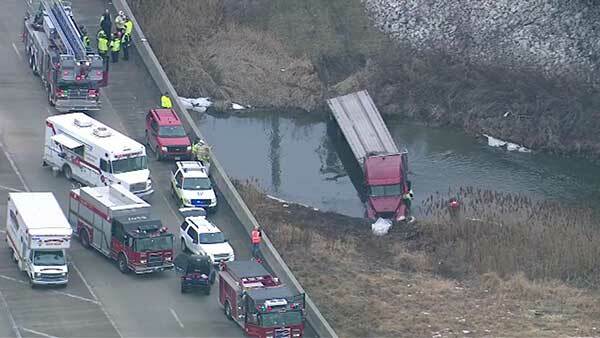 SOUTH HOLLAND, Ill. (WLS) -- Emergency crews are working to remove a semi-trailer from a shallow pond in suburban South Holland, officials said. Police are continuing to investigate the cause of the accident, which injured one person Thursday morning near I-94 and Route 394, police said. There are minor traffic delays in the area as crews work to remove the semi-trailer. Emergency crews are working to remove a semi-trailer from a shallow pond in suburban South Holland, officials said.